Last week, the Met Office published a report saying there is a 1 in 3 chance of a new rainfall record somewhere in England and Wales every winter. This warning comes nearly a decade after Sir Michael Pitt said that flooding was "an ever increasing threat". Sir Michael said this as he launched his review into 2007’s widespread floods: a devastating event that heralded ten years of significant flooding. In June 2007, more than 7,000 properties flooded in Hull. Over 200 people were evacuated from flood waters in Sheffield and 20 were airlifted from the roof of a building in the Lower Don Valley. In Louth and Horncastle over 200 properties faced deluge and in July, the River Severn rose to the highest recorded level flooding around 70 properties in Upton upon Severn. These are only some of the people and places devastated that year. In all, 55,000 homes flooded and 13 people lost their lives. In communities hit by flooding, emotions do not subside when the river levels return to normal. People are traumatised and angry - every new raincloud brings uncertainty and distress. These events live long in the memory, but the summer of 2007 brought this on an extraordinary scale. We saw that our approach to flooding needed to be stronger and more adaptable. Since 2007, we’ve invested £3.1 billion to reduce flood risk across the country - almost double that if you include spending on maintenance. For instance, the refurbishment of the Hull Tidal Barrier which is better protecting 17,000 homes. We have constructed 1,176 new flood defences to better protect more than 480,000 properties. Many of our flood schemes incorporate a range of measures including catchment-wide approaches and natural flood management, alongside traditional engineering. We can now also make longer term plans because the Government has committed to a £2.5 billion 6-year investment programme protecting a further 300,000 homes by 2021. We still have much to learn and improve on but we know that, on average, £8 of benefits are achieved for every £1 invested in flood defence schemes. We now send targeted flood warnings to 1.26 million people in England – giving people vital time to prepare for flooding. We formed the Flood Forecasting Centre with the Met Office to give communities and our partner organisations more accurate and timely forecasts. 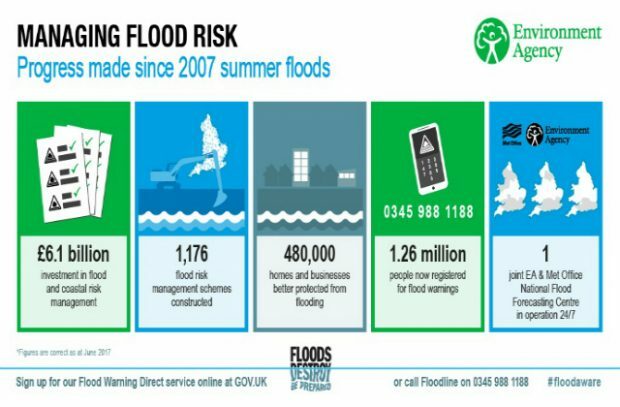 This is not only at the cutting edge of a young science, but also compliments our continually improving risk information and free flood warnings which you can check at GOV.UK or on 0345 988 1188. One of the major elements of the Pitt Review was the need to put communities back at the heart of decision making in flood management. 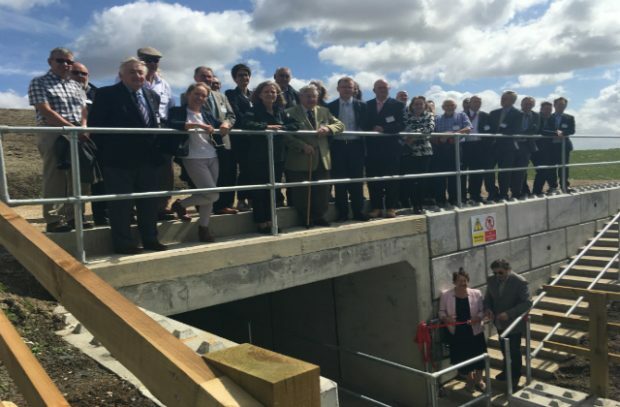 This was achieved partly through the strengthening of the twelve Regional Flood and Coastal Committees, which give independent members a key role in deciding local priorities. The Review also ushered in a new era of technological advances in managing flood risk (you can find out more about this in my colleague John Curtin’s excellent blog here). You cannot stop flooding completely in England and climate change increases this challenge. However, when severe weather does strike, there are 6,500 incident trained and committed Environment Agency staff who work with the army and emergency services to make sure people are safe and damage is limited. On a recent visit to look at flood defences in The Netherlands, our Dutch counterparts told me that they are keen to learn from our expertise in incident response. The Met Office’s report reaffirms Sir Michael Pitt’s warning that flooding is an ever increasing threat. The Environment Agency must continue to learn and adapt to stay one step ahead of a changing climate, but do not underestimate that challenge: our weather is getting more severe and there is a lot more to do. I don't understand this comment "This was achieved partly through the strengthening of the twelve Regional Flood and Coastal Committees, which give independent members a key role in deciding local priorities." I AM such an independent member and note that I have no fundamentally different role to the other members - who are elected councillors and so, in principle, much more connected to local priorities. Thank you for your comment and, more importantly, your ongoing work. The Regional Flood and Coastal Committees are an essential part of flood risk management in England. The comment in the blog was intended to convey that rather than Environment Agency officers making decisions for communities, the Committee members, who are all independent of the Environment Agency, have a key role in deciding local priorities. The diversity of voices in the committees is key to their effectiveness and reinforces that communities are at the heart of the decision making.